The What: Atlona, a Panduit company, has announced three new offerings in its growing Omega Series of switching, extension, and video processing solutions for modern AV communications and collaboration: the AT-OME-PS62 6x2 matrix switcher, and the AT-OME-EX-TX-WP and AT-OME-EX-TX-WP-E wall plate transmitters. The new products will be demonstrated at InfoComm 2019, (booth 3012) from June 12–14 in Orlando, FL. The What Else: Leading the latest wave of Omega products is the OME-PS62, a 6x2 matrix presentation switcher featuring three HDMI inputs and two HDBaseT inputs alongside a USB-C AV input for direct, BYOD-friendly interfacing with the latest mobile devices and laptops. The USB-C interface also can be used for data connectivity to the OME-PS62’s integrated USB 2.0 hub, as well as charging the connected device. 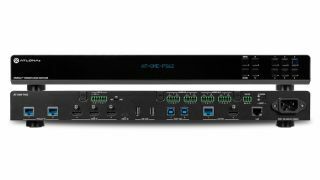 The switcher features HDBaseT and HDMI outputs, along with 4K/60 4:4:4 capability for all inputs and the HDMI output, plus USB extension over HDBaseT. Meanwhile, high-quality, 4K downscaling and upscaling on the unit’s HDMI output preserve color and spatial detail when converting content between 4K and 1080p for mixed-format presentation and display applications. The OME-PS62’s integrated USB extension capabilities combine with compatible Omega Series transmitters and receivers to address the challenge of connecting between USB devices at remote locations, forming an integration solution for use cases including software videoconferencing and interactive displays. Additional integration features include auto-switching, audio embedding, and de-embedding; audio output matrix mixing; display control; microphone input with mixing and ducking; internal video test patterns for setup and troubleshooting; a customizable welcome splash screen; and the ability to remotely power Atlona HDBaseT devices via PoE. Transporting 4K/UHD video, embedded audio, control and USB via HDBaseT to compatible receivers and switchers, the new OME-EX-TX-WP and OME-EX-TX-WP-E wall plate transmitters enable convenient HDMI and USB data connectivity on walls, in furniture, or in floor boxes for presenters and meeting participants. The OME-EX-TX-WP features a U.S. one-gang form factor and ships with interchangeable black and white trim kits, allowing inconspicuous installation while simplifying ordering for integrators. The OME-EX-TX-WP-E offers similar benefits for commercial installations in Europe, with a two-gang enclosure and swappable EU and UK faceplates and brackets. Both models can be powered via PoE from Atlona Omega receivers and switchers, and like the OME-PS62, can be remotely managed with the Atlona Management System (AMS 2.0) software. The Bottom Line: The AT-OME-PS62 6x2 matrix switcher delivers exceptional performance and value for 4K/UHD presentation and conferencing applications in medium-to-large AV environments, while the AT-OME-EX-TX-WP and AT-OME-EX-TX-WP-E wall plate transmitters provide discreet, cost-effective AV interfacing for North American and European installations, respectively. The OME-PS62 ships in May and will be joined by the OME-EX-TX-WP and OME-EX-TX-WP-E in June.